Are you looking for adventurous accommodations to go along with the adventurous itinerary you've selected for your next escape? Obviously, there are some pretty amazing places to stay when you strike out into the more remote areas of the planet, but we have six unusual lodging choices located in some very unique places. These options stretch from mountainsides to treetops to the very bottom of the ocean itself. And in most cases, these places are eco-friendly, are made from exotic materials, and offer views that simply can't be beat. Getting there can often be half the adventure, but we promise it will be well worth the effort. Set in the branches of a riverine ebony tree at Tongabezi in Zambia, this luxurious tree house found at the Tongabezi is a luxury resort is the very definition of unique accommodations. 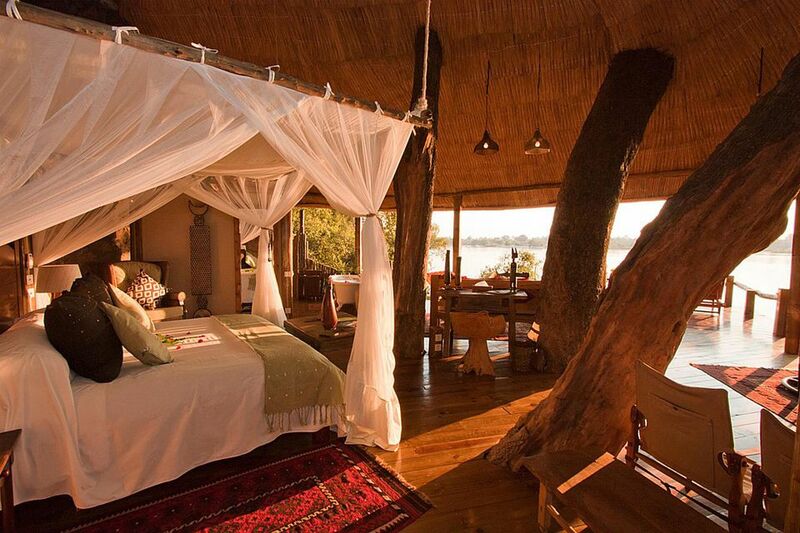 The tree-top lodge overlooks the Zambezi River and is found just upstream from the spectacular Victoria Falls. It has a king-size bed with a canopied mosquito net, air conditioning, and space for private dining and lounging in the room itself. You can even enjoy the view from the claw-footed tub in the bathroom, too. Tongabezi is well known for its impeccable service, fine dining, and a romantic atmosphere that makes it very popular with couples. The resort has a number of attractive treehouses and cottages overlooking the river to choose from, each with its own unique vantage points. If spending the night in a treehouse is right up your alley, then Treehouses of Hawaii has you covered. You can book a treehouse on the island of Maui, or you can choose the more exotic "Big Beach in the Sky" treehouse on the island of Hainan in the South China Sea. These unbelievable accommodations are located just a stones throw away from the sea, where a statue of Guanyin – the Buddha Goddess of Compassion, overlooks the water. This magnificent sculpture is actually eight meters taller than the Statue of Liberty and makes for an imposing sight, to say the least. Tariff for the treehouse, which holds four to six people, includes entry into the Nashan Buddhist Culture Zone as well. You can get here via Hong Kong or China. If you want a treehouse closer to the US, check out the other choices Treehouses of Hawaii has to offer on Hana or Maui. Your overnight starts with a dive through a tropical mangrove habitat in Emerald Bay to reach this lodge, which is located 21 feet below the ocean's surface off Key Largo in Florida. Jules' Undersea Lodge was originally an underground research laboratory that was located off the coast of Puerto Rico, but today it's an overnight guesthouse where visitors can view tropical angelfish, parrotfish, barracuda, and other creatures just outside their windows. The Undersea Lodge has two bedrooms, hot showers, and a shared communal area. Dinner and breakfast are brought to you by staff and an umbilical cable delivers fresh air, water, power and communications from a control center that is manned 24/7. In the winter, a helicopter brings you to the Canadian Mountain Holiday's Bugaboo Lodge, which is set in a mile-high valley surrounded by the snow-covered peaks of the Canadian Rockies. After a day of being ferried to mountainsides by helicopter then picked up again after a powder run, you can soak in the rooftop hot tub and watch the stars overhead completely free from encroaching urban light. The lodge has 35 rooms in total, each with private baths, a chef who prepares both gourmet and down-home meals, a climbing wall (if you haven't had enough exercise), a sauna, and a steam room. Canadian Mountain Holidays offers a variety of week-long heli-ski and heli-snowboarding weeks for advanced-intermediates to expert skiers and snowboarders. Most of the trips are to remote lodges in the Bugaboos, Cariboos, Monashees, Purcells and other mountain regions in British Columbia, just on the western side of the Continental Divide. The country of Jordan has a lot to offer adventure travelers looking to explore the local culture, history, and remote landscapes. And one of the best places to stay while there is without a doubt the Feynan Ecolodge. Located in the Dana Biosphere Reserve, Feynan is surrounded by miles of wilderness that stretch in all directions. That makes it a great place for stargazing, and as such there is a telescope on the roof that is always a favorite of guests. Run completely by solar power, with now electric lights at night, the lodge is instead lit up with candles, giving it an amazing ambience that simply can't be found anywhere else. With just 26-rooms, the place is always peaceful and quiet, giving visitors a chance to rest, relax, and immerse themselves in the local bedouin culture. There are plenty of great safari lodges to choose from throughout Africa, but few are as impressive and relaxing as Gibb's Farm in Tanzania. At the center of this sanctuary is a restored colonial farmhouse, which is surrounded by 17 smaller cottages that serve as guest accommodations. Visitors can roam the grounds freely or go on guided walking safaris along the rim of the Ngorongoro Crater. Game drives are available to local animal preserves as well, making this African escape the perfect blend of adventure and quiet reflection.